She is Miyu. We decided her name 5 days after her birth. I love this wear very much. It's a gift from a reader, thank you very much. 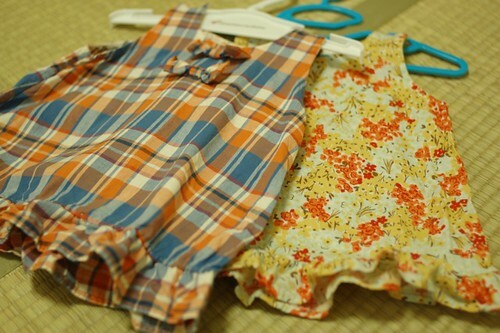 These are what I sewed for her. They all are from a sewing book. The patterns are simple and beautiful. I love the book. Today she cried a lot and I wrapped her in the blanket what I made for her. She likes this style. Nice to meet your little baby. She looks very pretty and healthy, congratulations!! She's gotten bigger in the last couple weeks! 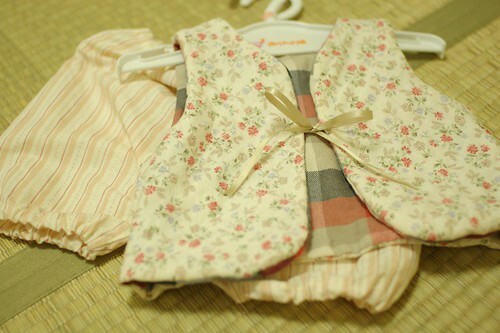 And I hope she likes all her beautiful clothes :) Thank you for posting even though you're so busy! Miyu is simply gorgeous! She's a lucky little girl to have such a beautiful wardrobe of dresses too. How precious is she! Thanks for letting us know her. Your work is exquisite! She is so lovely, and the clothes you've sewn are really pretty! I love you Miyu. Beautiful name and you are soooo loved, I'm sure of it. May you grow up healthy and enjoy life with your family. Miyu sounds beautiful indeed! Thanks for letting us know. And what a lovely blanket you made. Best wishes <3 from The Netherlands. Oh! Miyu is such a cute little angel. Miyu is a beauty! Have fun with your little tomato! Such a beautiful girl! One day she will look after what you did for her and she'll want to do other beautiful things. All the best for you, my dear, and for her too!!! she is so precious! congratulatioons! She is just lovely, and so is her name. Enjoy every minute! Mai, she is beautiful and seems such a sweet bundle! What a fortunate girl to have such lovingly made clothes. Congratulations. Miyu is beautiful. I look forward to seeing what you sew for her as she grows. Hello to Miyu! She is divine! Such a cute name, welcome Miyu! Welcome to the world Miyu! She's a beautiful girl. Congratulations. She is a beautiful girl, and the things you have made for her are beautiful too! Thanks for "sharing" Miyu with us on your blog! Oh, Miyu is beautiful! :-) Thank you so much for sharing pictures of her with us. She has plenty of "aunties" around the world looking forward to watching her grow up! I wish you and your family much love and good health. Ohhh, Congratulation! !, She's so cute!! Mai, your baby girl is adorable! And the things you made for her, so so cute. I thing you both are lucky and your husband too for having two beautiful ladies in his house. Dearest Mai, she is sooo pretty and adorable! Her name is beautiful too. 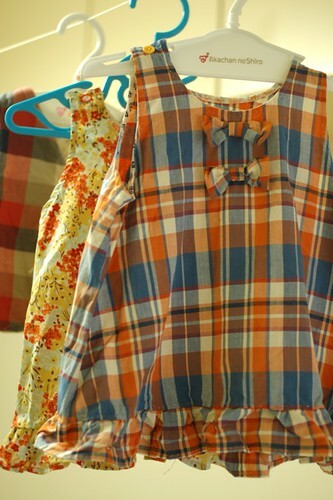 :) I really love the dresses you sew for her. Thanks for sharing your book with us. I will have to check it out coz i really adore simple patterns. Have a lovely merry happy weekend and love to you! Miyu is a beautiful name. I love seeing her wrapped up in her mother's love! Miyu is like a flower. She's so beautiful and her name too. God bless you. I wish you all the best. Miyu is beatiful! What a lucky little girl to have you for her mom...the clothes are adorable. I don´t know what it means, but Miyu is a very beautiful name! I follow your blog for a year now and wish your little family all the best! She's definitely grown well and perfectly under her loving mummy's care. She is so sweet! And your sewed dresses are great! Oh Mai, she is so adorable. I love all the clothes you made for her. She's so lucky she has a wonderful Mama who makes everything for her. What a lovely name for such a beautiful lil girl...she's so lucky to have such pretty dresses in her wardrobe...she'll look adorable in them. Oh my goodness, she just gets cuter and cuter every day! I just discover this blog recently and I have to say that your works is so unique and so beautiful. your works and your blog are so inspiring! I have only just discovered your blog recently, and want to say thank you for making such a lovely blog, and congratulations for Miyu! She is beautiful. I have really enjoyed reading about your trips and adventures (especially since I would love to visit Japan but have never been), and have been very inspired by the things you make. she is very beautiful. Congratulations on your sweet little Miyu. And the cloths you made for her are beautiful! Congratulations! She is so cute. What a lucky girl to have a creative mommy like you. She is a very beautiful and healthy baby! The clothes you made for her are really cute. Congratulations and enjoy your baby!! Congratulation to a very nice little girl. Best wishhes from Eva Sweden. Miyu is the sweetest little tomato ever. She is growing so big. I love her wardrobe. Beautiful!! Congratulations! There is nothing like a sweet baby girl to snuggle! Parabéns pelo seu bebê! Ela é linda! Felicidades para você e sua família. Beijos do Sul do Brasil. I like your blog so much! I've been hours on it... i'm a follower and fan. Lovely name for the girl. She is sweet!